a loose take on TNF-alpha at the cross roads of immunity, obsession & heart function (real science here & here). Have you ever seen the list “100 Benefits of Meditation“? Of course, many of these benefits are psychological. You know, things like: helps control own thoughts (#39) and helps with focus & concentration (#40). But many of the 100 benefits are rather physical, bodily, physiological, immunological and even biochemical benefits (such as #16- reduction of free radicals, less tissue damage). These are awesome claims, and I’ve certainly found that mediation helps me feel more emotionally balanced and physically relaxed, but I’m wondering – from a hard science point of view – how legit some of these claims might be. For example, “#12 Enhances the immune system“ – REALLY? How might yoga and mediation enhance my immune system? In a previous post on the amazing vagus nerve – the only nerve in your body that, like the ancient Kundalini serpent, rises from the root of your gut to the brain – AND – a nerve that is a key to the cure of treatment resistant depression – it was suggested that much of the alleviation of suffering that comes from yoga comes from the stimulation of this amazing nerve during postures and breathing. Somehow, the ancient yogis really got it right when they came up with the notion of Kundalini serpent – so strange, but so cool! 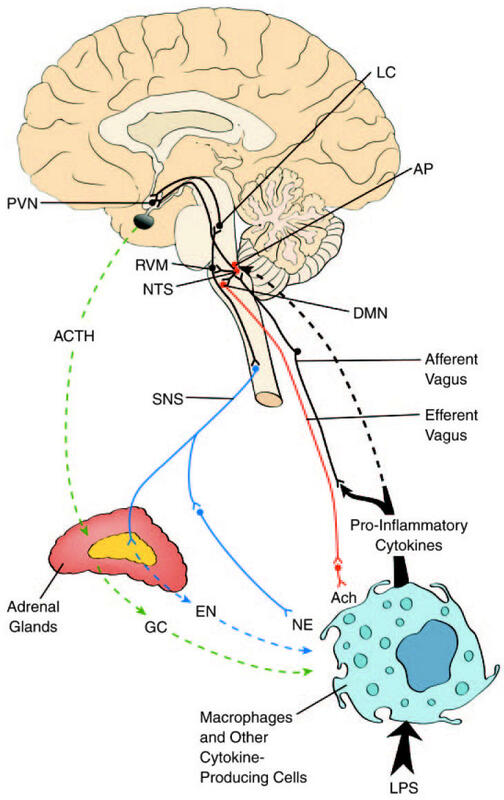 I happened to stumble on a paper that explored the possibility that the vagus nerve might also play a role in mediating communication of the immune system and the brain – and thus provide a mechanism for “#12- Enhances the immune system” Here’s a quote from the article entitled, “Neural concomitants of immunity—Focus on the vagus nerve” [doi:10.1016/j.neuroimage.2009.05.058] by Drs. Julian F. Thayer and Esther M. Sternberg (Ohio State University and National Institute of Mental Health). The scientists then investigate the evidence and possible mechanisms by which the vagus nerve sends immunological signals from the body to the brain and also back out to the immune system. Its not a topic that is well understood, but the article describes several lines of evidence implicating the vagus nerve in immunological health. So bend, twist, inhale and exhale deeply. Stimulate your vagus nerve and, as cold and flu season arrives, awaken the serpent within!